24) Hot glue gun with glue sticks, or quilting pins. *Please note: This is cake was decorated based on a photo sent to me by a customer. I am not claiming this cake as my own original design. This is simply a tutorial on the techniques I used to come up with this cake. Cake decorating often takes days of planning and work. Fondant cakes are especially time-consuming, so I've divided this tutorial into 3 parts - each part representing the work that was completed that day. This cake was due on a Saturday, but I began working on this cake on Wednesday. I hope you find this tutorial informative and helpful. And if you have any questions please feel free to leave a message in the comments box below or contact me by email through the "contact" link on my homepage. Enjoy! Wednesday (3 days before the cake was due) was dedicated to making the decorations that would need time to dry, and to also make my frostings and fondant. The first decoration piece I started was the large John Deere logo on the front of the cake. I Googled "John Deere Logo" and found a black and white image that worked perfectly. I "right clicked" on the image and copied and pasted it to Microsoft Paintbrush. I resized and cropped it on Paintbrush and printed it out. Since my cake will be about 4" tall, I wanted to be sure the logo would be a little taller than my cake (my printout is about 4 1/2 inches tall). Next, to protect the paper from any moisture and make it sturdier, I covered the entire logo in clear masking tape. Try to get the tape as smooth as possible (no ripples or bubbles), and be sure to cover the entire logo with tape. Do the same on the opposite side of the paper. Next, cut out the logo with a good sharp pair of scissors. After fondant and gum paste have been well kneaded, add a bit of Wilton gel color in Kelly Green. Knead until color is well blended. Add more color if needed, until desired color is reached. On a surface dusted with cornstarch, roll the fondant/gum paste mixture until it is slightly larger than the logo. Also be sure the fondant/gum paste is rolled thick enough to remain sturdy, about 1/4" thick. With the logo placed on the rolled fondant/gum paste mixture, trace around the edge of the logo with an X-acto knife to cut out the logo's background. To make cutting easier, keep knife tip greased with a tiny amount of shortening (re-grease after a few cuts). Also, keep your cuts short (about a centimeter at a time) to keep from pulling the fondant/gum paste and distorting it. Remove the paper logo and neaten the edges with the X-acto knife. Place logo background on a piece of wax paper and set aside. Make another fondant/gum paste mixture in the same amount as for the green background of the logo. Color it with Wilton gel color in Buttercup Yellow and knead until color is well mixed, adding more color, if needed, until desired color is reached. Add a small amount of Wilton color gel in Golden Yellow to better match the John Deere yellow. Knead until well blended and set aside. Next, with your X-acto knive, trace around the logo to cut out all parts that will be yellow (all the "white" on the paper image). Place a large piece of wax paper down on your work surface. Place the John Deere yellow fondant/gum paste blend on the wax paper and roll until very thin (as thin as you can get it without tearing it). 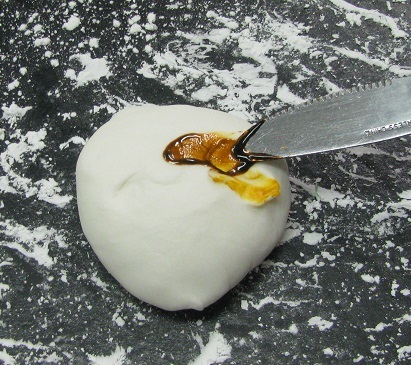 Set aside the yellow fondant/gum paste mixture and allow to dry overnight. Meanwhile, make frosting (place in a sealed container and refrigerate) and fondant (wrap well, leave at room temp) for later use.